Over time, cooktops can build up quite a bit of gunk and grime. But cleaning them doesn't have to be a daunting task. 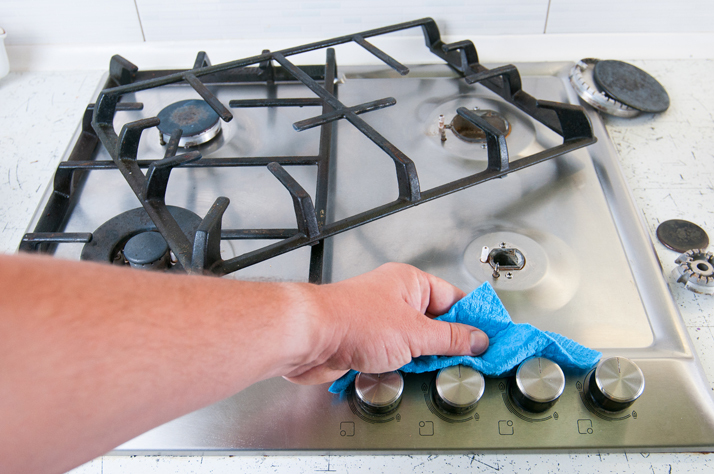 Read on to learn some tips that make cleaning both gas and electric cooktops easier. Paper towels and liquid surface cleaners are a good starting point for cleaning a gas or electric range, but for particularly dirty cooktops, other tools may be necessary. Cooktop cleaning brushes are relatively cheap and can be used for pushing crumbs and debris off as well as breaking up tougher grime. A razor scraper can help remove burned-on stains. At any given grocery store, you can probably find a dozen kitchen-cleaning sprays made up of different mixtures. But two of the most simple and effective cleaners aren't fancy products at all: Lemons and vinegar are both cheap and powerful. Lemons are particularly useful in conjunction with baking soda; just sprinkle a light amount of baking soda on the dirty surface, then rub it with a lemon before removing everything with a damp towel. As for vinegar, a solution of two parts water to one part vinegar in a spray bottle is good for everyday cleaning. Many cooking stations--especially gas stove tops--have burner components and other parts that can easily be taken off. If your cook top has stubborn debris baked onto it, consider taking off what parts you can and soaking them in your sink. Much of the gunk will slide off on its own, and the rest will be easier to scrub off following a soak. Dry thoroughly before replacing. All of the tips in this article will be more effective if you clean your cooktop regularly. Consider adopting a weekly cleaning schedule, and if you make a particularly big mess after a given meal, take the time to tidy up so that stains and grime don't set in. Also be sure that you wait for the cooking surfaces to cool before you clean, and ensure everything is re-assembled properly.